Is This the Most Popular Cafe Table on Instagram? Not only can brothers Christopher and Thomas Newbury make good coffee, but their coffee shops, Reveille Coffee, and restaurants, Cafe Reveille, are magnets for hungry, design-loving guests. Cafe Reveille’s first location was in San Francisco’s up-and-coming Mission Bay neighborhood, and due to popular demand has added two other locations in the last two years—in Lower Haight and Berkeley. 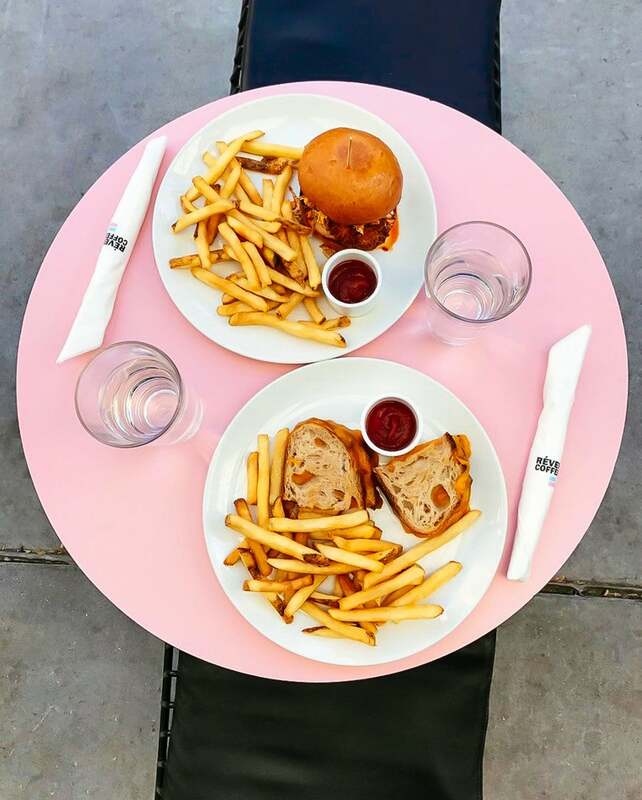 Instagram-savvy foodies are flocking to the spaces for oft-photographed staples, like housemade granola, avocado toast, burgers, and salads—but also to get the perfect picture on a pink cafe table. You see, the restaurant’s outdoor space is a beacon of millennial pink—now a trademark of Cafe Reveille. If all the tables are snagged when you visit, there are plenty of other picture-worthy opportunities. The bar features a large painting, wooden shelves stocked with wine bottles, colorful cement tiles, and a marble countertop. And if you are looking for something more industrial, the heart of the space is their German PROBAT roasting machine. We sat down and talked to Christopher to find out what inspired the pink tables and how design plays a role in the success story of a restaurant. Tell us how you got into the restaurant and coffee shop business? My brother Thomas and I started making coffee out of a converted DHL delivery truck. It has one small, two-group La Marzocco espresso machine, and a first of its kind. It’s still parked in Jackson Square. What was the inspiration behind the design of Cafe Reveille? Being able to travel and visit the old beautiful cafes and restaurants throughout Europe is definitely an inspiration. However, we still enjoy adding modern touches to our design. With this, we wanted to create a unique experience. What is the hardest thing when opening a restaurant? Hardest is definitely the buildout. With this space specifically, we had to fit a lot in one space, our coffee roasting operation, coffee bar, kitchen, and a wine bar. Making it all flow together took a lot of planning. The most rewarding aspect is being able to see customers enjoy themselves with their family and friends—it’s the best. What’s the most valuable lesson you learned during the process of opening Cafe Reveille? After being open a little over a year, we are still changing things up and trying to improve service and efficiency. We are growing with the neighborhood and love being here. As we get busier, we are working on developing new offerings both food and beverage. We see pink tables popping up everywhere on Instagram. Were the pink tables intentional to attract more Instagram-savvy guests? It wasn’t really. We were actually surprised how people loved them so much. We just liked the look and feel of them. It matched our aesthetic and branding. Our Reveille Coffee Co. logo is an abstract sunrise, which has the color pink—we took from that. Do you think design plays a role in how successful a restaurant can be? It’s definitely an added bonus, but ultimately it comes down to the product, service, and hospitality. How do you want your guests to feel when they enter Cafe Reveille? As if they are on a mini vacation. Even if it’s only for a couple of minutes grabbing a quick coffee. Most importantly though, we want them leaving happy and satisfied with their experience. What’s the most-ordered dish on the menu? Homestyle Breakfast comes with eggs, toast, bacon, or lamb merguez (housemade lamb sausage) with homemade jam and butter. The whole milk latte with our single origin “Paradise” espresso is the most ordered drink. This story was originally published in May 2017, and has since been updated with new information.